The student favourite currently operating on Dame and Nassau Streets is coming to our own Thomas Street. KC Peaches are seeking planning permission to develop 33, 34-35 Thomas Street and turn it into a new cafe and restaurant. A lot of work is needed to turn the site into a restaurant and planning permission notices can be seen in the windows along Thomas Street. Firstly they will need permission to change the use of the site from retail to a restaurant. The next stage of the planning permission looks at the internal structure. Openings in the walls between the three buildings will need to be provided. Non structural partitions are needed for food preparation areas, storage, ancillary facilities and of course toilets. New counters need to be built. Permission is also sought for new signage at the front of the buildings as well as shop front lighting and awnings. Founded by Katie Cantwell, the popular restaurant first opened its doors on Pearse Street in 2006 with the intention to provide good quality food at a reasonable price. 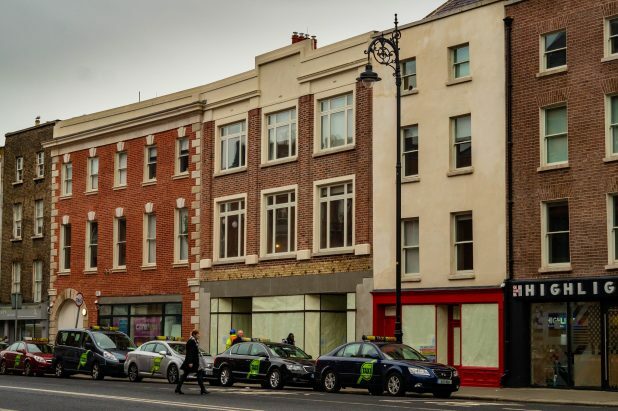 Now with locations on Nassau Street, Dame Street and Stephens Green its popularity continues to grow and grow. Should the Thomas Street site get the go ahead it will be its 5th location and a welcome addition to the area. They very much live by the old saying, “you are what you eat” and aim to provide all fresh and natural food free from additives, preservatives, artificial flavours or colours. Their menu offers a wide selection of choices for breakfast, lunch and dinner as well as a variety of cakes and tarts for those with a sweet tooth. The breakfast menu has a bit of everything, from homemade buckwheat pancakes, organic porridge and fresh omelettes to a full Irish breakfast or, the millennials favourite, avocado on toast served with poached eggs. Perhaps what will excite people more than the breakfast will be the hot and cold buffet counter. Prices are based on size not weight so grab a small, medium or large box and see how much you can cram in there. A number of vegan, vegetarian and gluten free dishes are also served daily. The restaurants popularity amongst students is no doubt one of the main factors they have chosen Thomas Street as the location for their newest eatery, with more and more student accommodations coming to Dublin 8 and it’s perfectly located right next door to Highlight student living. Although students aren’t the only target market here, foodies and those trying to eat well without breaking the bank will flock in droves to get their hands on some fluffy pancakes or a wholesome full Irish breakfast.